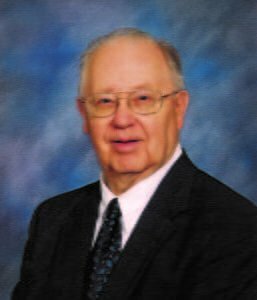 Harold R. Watkins, president emeritus of Board of Church Extension (now known as Disciples Church Extension Fund) died on Dec. 2, 2015. A graduate of Bethany College, Bethany, WV and College of the Bible (now Lexington Theological Seminary), Lexington, KY, Hal began his career serving as organizing pastor of Park Avenue Christian Church, Tucson, AZ, followed by a pastorate at First Christian Church, Tuscaloosa, AL. Board of Church Extension, the Christian Church (Disciples of Christ) General Unit which assists Disciples congregations with capital planning and financing, recruited Hal to serve as a general representative with primary responsibility of new church beginning in January, 1958. The job required extensive travel, with Hal having visited nearly 200 congregations each year in his first 10 years of providing counsel and fund raising leadership. Hal served as Board of Church Extension’s President from 1980 through March 1995 after serving in every executive position of the organization. In his retirement, Watkins spent the 1996-97 and 1998-99 academic years as the director of field education at Lexington Theological Seminary and was the interim president of LTS for the 2001-02 academic year. He also was called upon to help coordinate the merger of Church Finance Council into the Office of General Minister and President in 2007-08. Hal served on the board of trustees of Bethany College; the National City Christian Church Foundation; the board of directors of the United Church of Christ Insurance Board; the board of directors of the Ecumenical Church Loan Fund (ECLOF), Geneva, Switzerland; a past president of the Interfaith Forum on Religion, Art and Architecture (IFRAA); past moderator of the Denominational Investment and Loan Administrators (DILA); and past president of the World Convention of Churches of Christ. Watkins was ordained at First Christian Church, Wauseon, OH in July, 1950. He was granted honorary doctor of divinity degrees from Phillips University, Enid, OK and Christian Theological Seminary, Indianapolis, IN. In 2010 the Disciples Historical Society honored Hal and his wife Evelyn by naming a reading room at their Nashville, TN headquarters for them, which will be relocated to the new facility being built at Bethany College. Hal Watkins is survived by his wife of 65 years, Evelyn, son Mark (Kim), daughter Nancy, five grandchildren and 6 great-grandchildren. Calling will be on Tuesday, Dec. 15 from 4:00-8:00 p.m. at Geist Christian Church, Mud Creek Campus at 8550 Mud Creek Rd, Indianapolis. A memorial service will be held the following day, Wednesday, Dec. 16 at 11:00 a.m. in the same location. Messages of care may be sent to Hal’s wife, Evelyn, and adult children, Nancy and Mark, at 7601 Newport Bay Drive, Unit 118, Indianapolis, IN 46240.